We finished our recording of Sephardic music in October 2006. The CD is called "Saffron and Sapphire", and was launched in style in a concert at the Holywell Music Room. 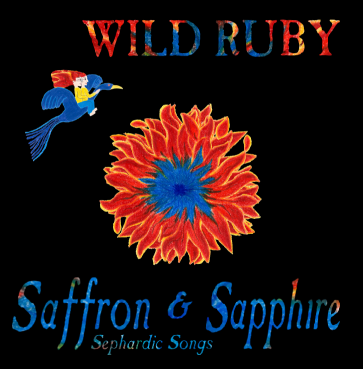 Saffron and Sapphire: Piquant Sephardic songs of passion and life: Tales of wayward daughters locked in tall towers; Love lost, found, denied and borrowed; Lullabies with bite and babies secretly swapped. 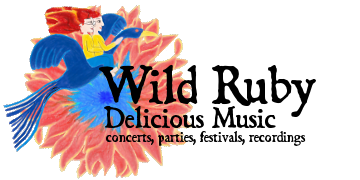 You can find some small music samples on our other pages. The price of a copy of the CD is £10, and we charge £1.00 for postage in the UK, £2.00 outside the UK. Please contact us for payment details or use one of the PayPal buttons below. We can also accept cheques or cash in UK pounds. We commit to sending your CD or CDs to you within 28 days of purchase, however the time will usually be much less. Contact us if you have a really urgent Birthday Present deadline to meet! Artwork copyright © 2006 Wild Ruby. All rights reserved.